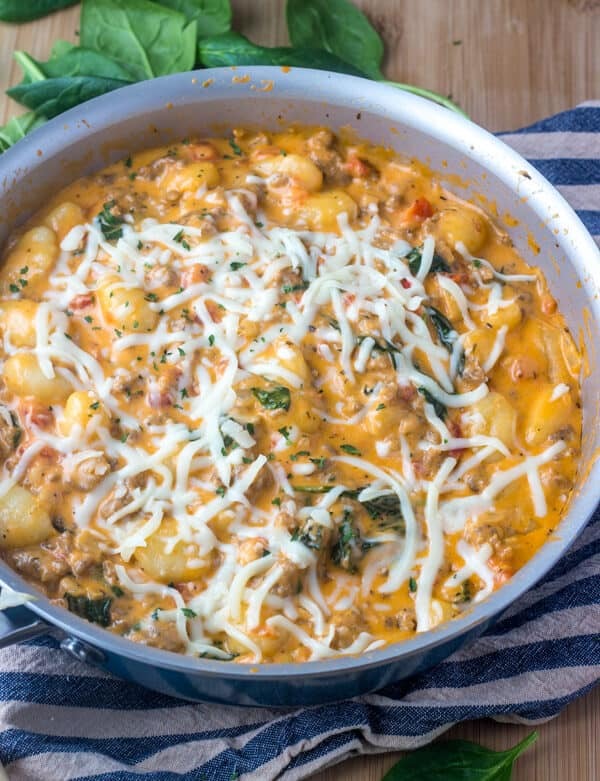 Gnocchi has always been one of our quick and easy go to dinner recipes. We like it pretty much any which way we can get it! Growing up in Minnesota we have things thing called Klub which is pretty much this big potato dumpling that has bits and pieces of diced ham inside and you serve it with butter and salt and gnocchi really reminds me of that, but the crazy shortened version. Gnocchi is known as “Italy’s Italian Dumpling”. While may eat it as a pasta, it is actually a potato dumpling that can be served many ways! When we first started eating gnocchi I literally would just put butter and salt on it, I know weird, but that was what I was used to and I couldn’t resist it. WHAT CAN I DO WITH GNOCCHI? There are literally a million different ways you can serve gnocchi. 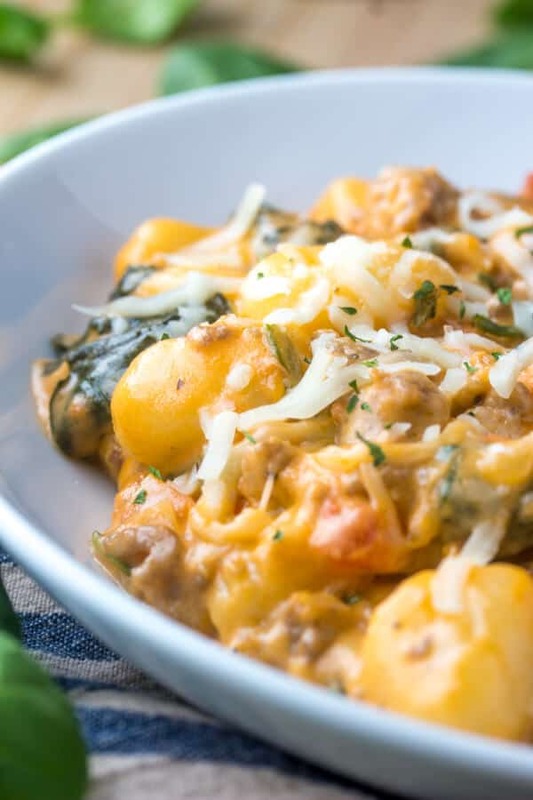 This One Pot Creamy Sausage Gnocchi is just the tip of the iceberg. You can boil it and serve it with a variety of sauces cream, tomato based, butter based, etc. You can also pan fry gnocchi and serve it like you would some fried potatoes. meaty, rich and flavorful. Those are all the qualities that I adore in my dinner recipes. We used garlic and oregano flavored diced tomatoes for this recipe but you can use any flavor that you like. Fire roasted, regular, tomato, basil and garlic, the sky is the limit on the flavors. It is easily adaptable as well. Want to add some pepper? Go for it! More cheese, who wouldn’t! In essence this is a quick and easy weeknight meal that gets people fed fast, fills them up and keeps them going back for more. 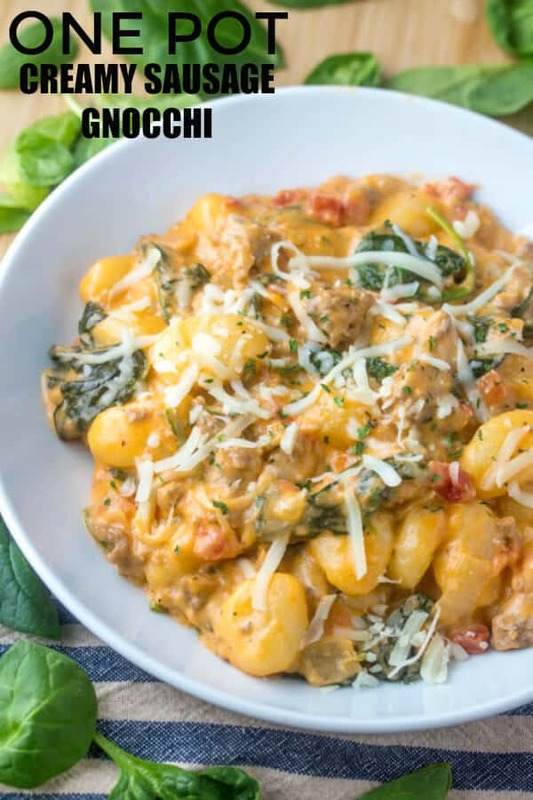 My kids and husband adore gnocchi and it is one of the recipes that we keep making over and over again with no complaints! 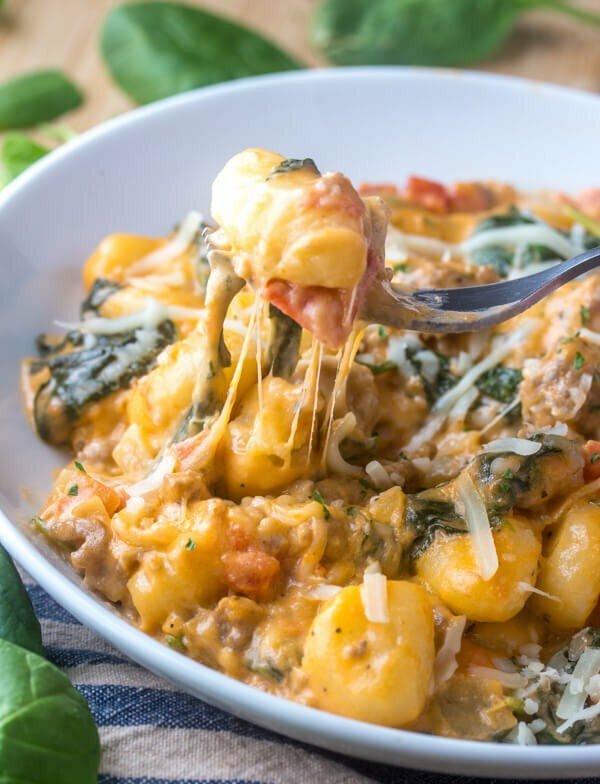 Want a quick hearty mean this One Pot Creamy Sausage Gnocchi is the perfect weeknight burst of flavor recipe that you're looking for! 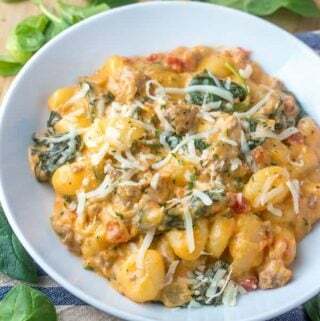 Add in your tomatoes, creamy, gnocchi and spinach and heat until gnocchi is cooked, spinach is wilted and some of the cream has reduced (about 8-10 minutes). Stir in your shredded mozzarella cheese until melted. Top with more cheese and parsley if desired. This is one of our go to meals. We have 2 small kids and not a lot of time to prep/cook. I’ve made this dish about 5 times now and is consistently one of our fave dishes. No modifications necessary as the flavors are full! That’s so awesome to hear, I love that you like this so much!! Thank you! This is my favorite new recipe! I’ve made it twice already, and the only thing I’ve done differently is used mini gnocchi. Sooo good! Yay, love hearing that! So happy you guys liked it! Great recipe, really tasty and the whole family enjoyed, will be making this again! So happy you guys all enjoyed it! One of our faves for sure! So happy you enjoyed it! We absolutely love this dish and cannot get enough of it! I made this tonight and it was excellent. I made my gnocchi from scratch and it’s ten times better than store bought and surprisingly easy! So glad I came across this recipe, it coaxed me to expand my cooking skills and get homemade gnocchi under my belt! So good !!!! I accidentally grabbed a can of diced tomatoes flavored with green chilies and it gave the dish a neat little kick . Thanks! So happy you liked it! Sometimes those happy accidents make things so much better! Definitely on our keeper list now! Made it without the spinach simply because I didn’t have any, but looking forward to trying it with spinach next time. No leftovers here either! Thats so great to hear! We adore this recipe and make it all the time! 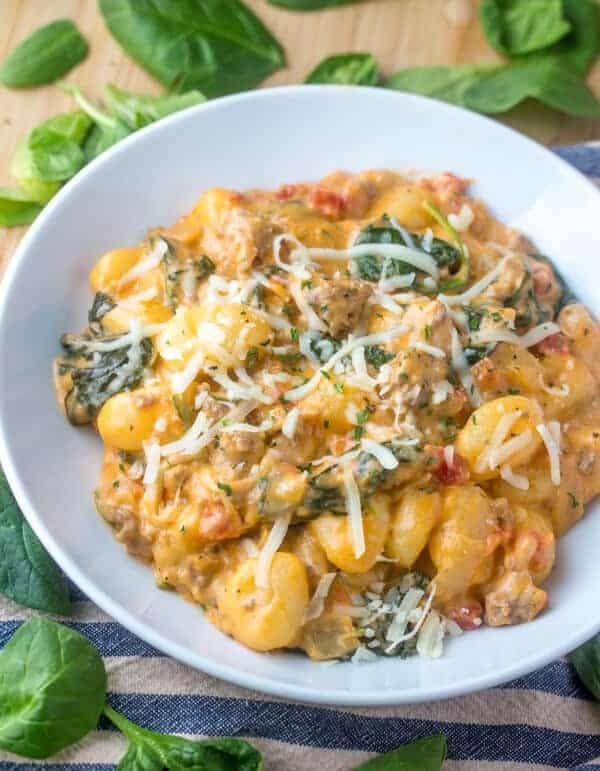 I was searching on Pinterest for a new dinner recipe and came upon your “One Pot Creamy Sausage Gnocchi” recipe, which looks sooo delicious! 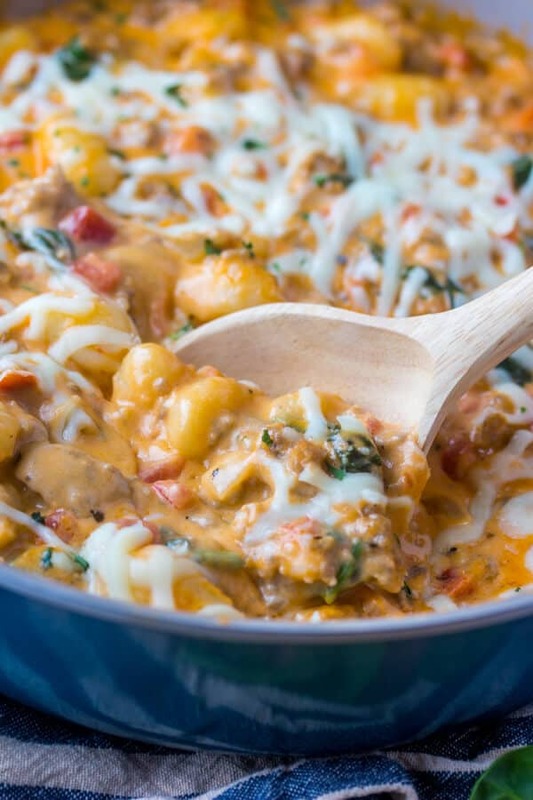 However, I have one question as I’ve never bought or cooked gnocchi before: Should it be thawed out before adding it to the skillet, or do you simply add it to the pan frozen? Thanks so much in advance for replying and for sharing your recipe!